Another cold front bringing frigid temperatures and snow to central and eastern US has sent natural gas prices higher again. 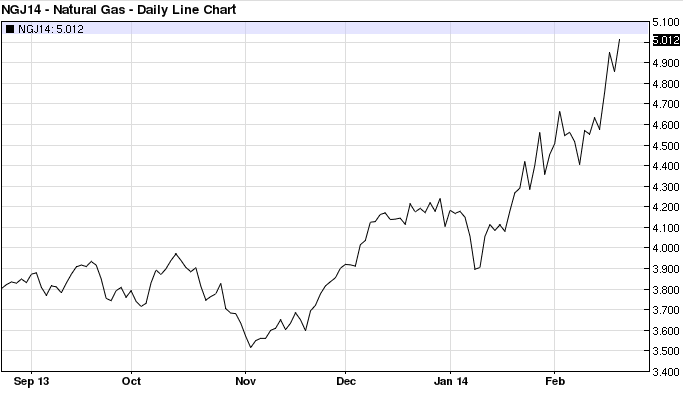 Even the April futures contract broke through $5 MMBTU - something we haven't seen in quite some time. 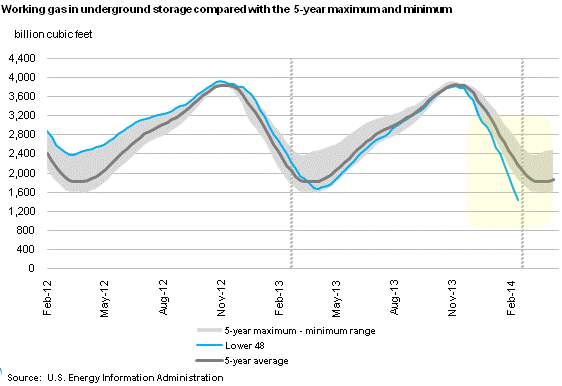 Traders are watching US natural gas stockpiles falling way below the 5-year range as demand for gas remains high. The high heating bills this year will be creating a temporary drag on US consumer spending - it's not just about the snow keeping shoppers home. This sharp decline in gas inventory has also brought into focus the expected spike in natural gas exports (see Greg Merrill's post). Very soon large amounts of natural gas will be flowing out of the US, providing support for prices. FOX News: - Dozens of facilities are set to sprout up along the Louisiana and Texas coasts to liquefy natural gas from shale formations as far away as Pennsylvania and Ohio for export around the world. The energy boom, which is turning the U.S. into a net exporter, could drive liquefaction capacity to an eight-fold increase in the next five years alone, experts say. That could mean hundreds of thousands of new jobs along the Gulf Coast, by some estimates. More than 110 liquefied natural gas (LNG) facilities now operate in the U.S., some exporting the super-cooled liquid, while others turn natural gas into an energy form that occupies up to 600 times less space than natural gas for vehicle fuel or industrial use. 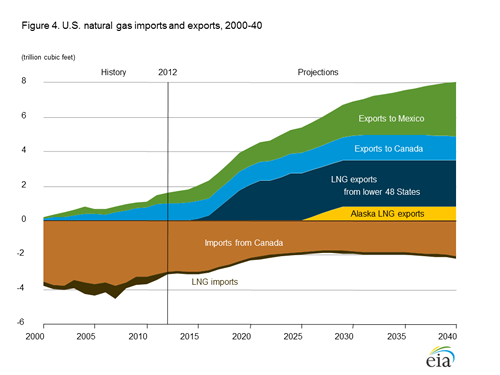 Worldwide, LNG trade is expected to more than double by 2040, according to the Energy Information Administration. Up to a dozen long-term deals, each worth billions of dollars, have been signed by American natural gas producers with companies in China, Japan, Taiwan, Spain, France and Chile, according to Reuters. The federal Energy Department has authorized companies to export up to 8.5 billion cubic feet per day of liquefied natural gas, about 13 percent of current daily production. Given the entrenched oil and gas industry, access to shipping and regional resources, the Gulf Coast is set to become the epicenter of the coming liquefaction boom. This means that the days of the $2 - $3 natural gas prices are over. In the years to come, it will no longer be just about the weather.